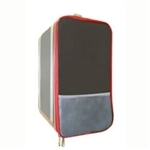 Black nylon microscope dust cover: 16" x 19.5". Nylon case has heavy duty straps and zip-down side. Separate inner liner provides support. Built of thick reinforced nylon. 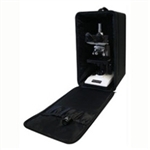 Includes padded cushioning inside and Velcro® straps to secure your microscope in place. Similar to the universal microscope carrying case, but larger with more interior space. Fits microscopes with trinocular heads.